After the Second World War the the Europeans longed for a relationship among peoples. On the occasion of the 800th jubilee, Eiken-Bruche (Germany) were looking for similar villages in Europe. In 1965 the dream came true due to the anniversary of Eicken-Bruche (Germany). The joy was great, as Eke (Belgium), Eecke (France) and Eiken (Switzerland) joined the "Chain of Oaks"
We are thankful to the founder Gerhard Granz from Eicken-Bruche (Germany), that he established the "Chain of Oaks". His main idea was: "With friendship to peace and harmony in all countries with all complaisant humans!" Since 1965 every two to three years the convention takes place in another country of the "Chain of Oaks". 1) The union should be a part to the international understanding in Europe. 2) Between the conventions many visits shall happen. 3) The official meetings are the highlights of the partnership. 4) The means for personal contacts are private accommodations for guests. In 2010 Eiken welcomed the guests from Belgium, France and Germany. 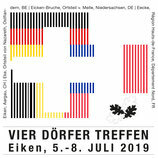 Now we're looking forward to the "Vier-Dörfer-Treffen" from 5th to 8th July 2019. Source: "Ortschronik 850 Jahre Eicken-Bruche"